← Question #10: Why do you put so much emphasis on exclusive Psalmody and create such a storm over a small issue? What’s all the fuss about? This entry was posted in Questions and tagged debates, Exclusive Psalmody, hymns, questions, sin, worship. Bookmark the permalink. Some who believe in exclusive Psalmody believe it is a sin to sing non-inspired hymns in worship, while others in the EP camp do not. This is a really controversial question within the controversial topic of EP. I realize not all EPers agree on the answer to this question. Of course, those who don’t hold to EP believe they have permission to do things in worship that are not forbidden. From this perspective, it would not be a sin to sing a non-inspired hymn in worship. But notice from this perspective that it would also not be forbidden to include _______ in worship, you fill in the blank. As long as Scripture does not forbid it, we are allowed to do it. This has never been the position of historic Reformed teaching. Instead, we believe that only that which is commanded is allowed in worship. This is radically different from the above proposition and it is known historically as the Regulative Principle of Worship. Scripture regulates worship by telling us what is to be included, not by allowing us to do whatever it does not forbid. Q. 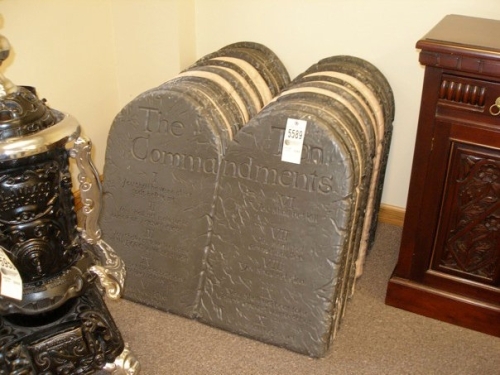 107 of the Westminster Larger Catechism: Which is the second commandment? Answer: The second commandment is, Thou shalt not make unto thee any graven image, or any likeness of anything that is in heaven above, or that is in the earth beneath, or that is in the water under the earth. Thou shalt not bow down thyself to them, nor serve them: for I the Lord thy God am a jealous God, visiting the iniquity of the fathers upon the children unto the third and fourth generation of them that hate me; and showing mercy unto thousands of them that love me, and keep my commandments. The Westminster Divines clearly stated their position on religious worship. If singing man-made hymns is worship “according to the imaginations and devices of men”, we can come to no other conclusion than to say that singing uninspired hymns is sinful. If it is not commanded by God, it is an act in disobedience to God’s revealed will. Again, I understand there will other opinions even within the EP groups, but I think this question is worthy of our discussion. Please chime in if you are so inclined. UPDATE: I forgot to add the observation that we have an Apostolic command to sing “psalms, hymns and spiritual songs” in the New Testament in Eph. 5:19 and Col. 3:16. If we understand these passages to be referring to the inspired Psalms of the Old Testament (not convincing to many, I know), we are violating this command by not singing the Psalms or by singing uninspired songs in their place. The point being there are several ways we could easily make the case that singing uninspired songs is in fact sinful. I think this is a worthy question for us to consider. Last year I was speaking to someone who understood the EP position (sort of) though he was not convinced. He was disgusted by the fact that some who were EP actually believed it was sinful to sing a man-made hymn in worship. I was surprised to hear that he was surprised. Of course that is what we are saying when we say that we only have authority to sing the Psalms in worship. To do anything else would be disobedient to God, and would be a sin. If you think singing uninspired songs is not a sin, I would be interested in hearing your justification for coming to that conclusion. I think a more serious question for consideration is this: How many angels can dance on the head of a pin? Or, if someone is on this blog on the Lord’s Day, are they breaking the Sabbath according to John Calvin? Or if they use lights and water, requiring the employment of someone else on the Lord’s Day, are they guilty of breaking the Sabbath by proxy? These are the burning questions of the hour. Meanwhile, 99% of all churches are eyeball deep in real apostasy as emergent heresy and mysticism sweeps the country. Good to see that the Reformed camp is busy discussing the deeply meaningful issues of the hour. Good grief. Well, from your username and post, it seems to me that you are one of the many people who are tired of and frustrated by being “blown by every wind of doctrine” arising from the Church’s–even the Reformed Church’s–even the EP Church’s for that matter–disunity and disorder. I too have grown weary and sick of this state, and I feel especially for you about your concerns of mysticism entering the Church. My sympathies are very much with you. Apologies though if I have presumed too much. It is important to realize that the worship of God is given the highest priority in the Reformed camp. As such, things which may seem “trifling” (like whether it is a sin to sing uninspired hymns) are not so. Even the “circumstances” (to use WCF terminology)–though adiaphora–are to be regulated by the general principles of Scripture. Along with this, the Reformed believe that the purifying of worship–which to them is a part of right doctrine–plays a large part in saving congregations–and thus eventually the Church–from serious error and heresy. Thus, it really isn’t fair to compare this question to asking how many angels can dance on a pin’s head (though I do realize that you were merely making a point). However, you are correct that the Church is in a state of crisis which should be addressed. People in the Reformed camp do indeed address those issues. They view those issues as deeply meaningful too. Though they view the worship of God to be of utmost priority, they do not discuss it at the expense of discussing those issues you have rightly mentioned and other like issues. I should mention though, that I am in no position to determine the position of the entire “Reformed camp” on this issue and can only speak from what I know of them. Indeed, technically I am a modern Evangelical because I am a member of a modern Evangelical Church. What I know is mostly limited to the relatively (relative to how much is out there) few Reformed works, articles, and blogs I have read or partially read and my experiences of browsing the Puritanboard. It could just be that I have had a selective experience of the Reformed camp; I do not deny that I am selective in what I read in that I try to read the best of the best in accordance with the wise maxim of a mathematician, “Learn from the masters, not the pupils.” From my experience and small knowledge of Church history, the Reformed are just about the nicest and most balanced Christians I have ever seen. The RPCNA’s website heading is telling: “Evangelism is not a spectator sport.” Yes, they do discuss issues which seem trifling–perhaps even seeming trifling to some within their camp, but they do not do so at the expense of discussing issues which everyone agrees to be important. If you have been seeing a lot of discussion on exclusive psalmody lately, it is important to remember a couple things. Namely, first that this is a site dedicated to this issue and so it will bring things up such as this topic which may seem trifling. Mr. Koller has another blog which deals with more general things. Next, that the surprising decision of the Free Church has brought to remembrance the issue of exclusive psalmody and so naturally everyone will be talking about it for a while–after which the hype will probably die down again, and people will go back to dealing with such issues as you have mentioned. However, your experience with the Reformed camp may have been different, and it indeed may encompass more than what I have been exposed to. I do not deny that in my studies I have encountered such issues of the Sabbath that you have mentioned–though in most cases they were refutations of those positions you mentioned. I’m sorry you feel that way about the Reformed camp because it is a terrible feeling. Thanks for posting and contributing to the discussion with the very reasonable concerns contained in your answer! It is a huge presumption to say that Eph. 5:19 and Col. 3:16 apply to the OT Psalms only and to force that weak interpreation on the church at large causes division where there doesn’t need one. There should be room within individual congregations to be EP within the larger denomonation if that is their conviction. but problems always occur when you are stricter than God’s Word.